I have been biking to work from time to time for many years first in Calgary (which has a truly awesome bike path system) and now in Vancouver (which has a pretty pathetic bike path system despite lots of hype and money spent on downtown bike lanes). But I have never biked more than a few times per month on a consistent basis. Here at the Black Swan Blog I have discussed lots of interesting applications in the field of electrically-powered transportation: everything from cars to planes and boats. I have also been keeping a close eye on developments in the area of electric bikes. The announcement of the e-bike by the folks that make Smart Cars seemed to me to legitimize the whole concept. And after I published my blog on electric cars my good friend and high-tech guru Steve Darden pointed me in the direction of the Copenhagen Wheel. This looks like a fascinating concept but unfortunately (?) they have been so successful at generating interest that they have deferred actual delivery of their product until 2015. (by the way, do not visit Steve and Dorothy’s site unless you are really comfortable with escape fantasies and feelings of envy). 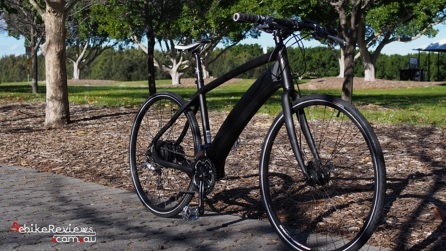 I started looking really seriously at electric bikes and after doing a bit of research I paid a visit to Evolution Bikes and test-drove a couple of different bikes manufactured by BH Bicyles. Although the brand is best know for racing bikes their line of electric bikes offers outstanding technology and design. These bikes are “pedal assist” meaning you have to actually pedal to engage the electric motor. But with the BH bikes you won’t be breaking a sweat no matter how fast you pedal. The bike senses the pedal pressure and provides more boost the harder you push – you feel super-human as you climb moderate hills at 25-30 kph. In the end I purchased a BH EasyMotion Neo Carbon like the one pictured above. At about 20 kg it can easily be carried on a bike rack and the 30 gears mean that the bike is a very comfortable ride even without the electric assist (I can’t say the same about the Smart e-bike which felt slow and clunky under electric power and was really not a fun time in manual mode). The best part about having the electric bike is that it allows me to use my Cannondale Synapse Road bike more as well. I have an 18 km commute each way with several large hills and a rather long and nasty bridge to contend with. I found biking both ways on the Cannondale took just a bit too much time and energy for me to do on a daily basis. But now I am able to take the Cannondale one way and the EasyMotion the other. Since buying the electric bike I have only driven to work once. The 4,000 lb van can now be used for what it is really good at – hauling around 5 adults plus dog and luggage when we go on family outings and road trips. Biking every day has been good for my fitness level too. This past week my wife brought to my attention the Vancouver Rotary Club Bike-A-Thon in aid of Deaf and Hard of Hearing in British Columbia. It is a 120 km ride and I now feel that is something I can take on (we’ll find out if that is true on July 13). Of course that will be on the Cannondale, not the electric bike. P.S. Should you be interested in supporting me on this ride for charity you can make a donation at my Ride-A-Thon page.